Continuing down the Richardson Highway took us through the Keystone Canyon. Beautiful water falls and massive ornate cliff faces enthralled us. We scouted some photographs for future reference and made a few quick ones. The rain had been heavy for the previous couple of days so the water was high and a little muddy. The water falls were stunning, Bridal Veil being the famous one on this stop. I really liked the canyon walls against the water myself. It was also interesting to note that a path, two horses abreast, was cut into these canyon walls as part of the trail from Valdez to Fairbanks. Supplies from the port in Valdez were hauled by horse sleds up the trail that is now the Richardson highway to support the miners up there. 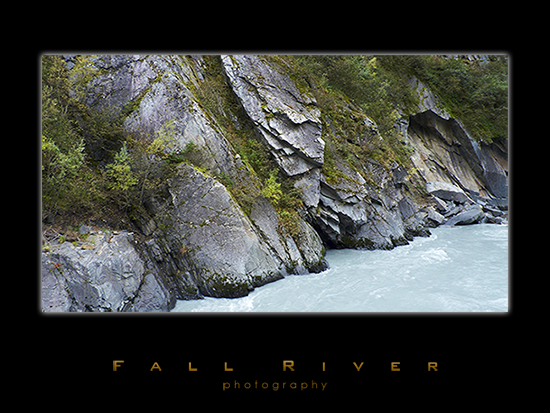 This entry was posted on Thursday, September 24th, 2009 at 8:10 am	and is filed under Alaska and tagged with fall colors, fall colors alaska, fall river photography, fine art landscape photography, keystone canyon, Valdez, Valdez Alaska. You can follow any responses to this entry through the RSS 2.0 feed.